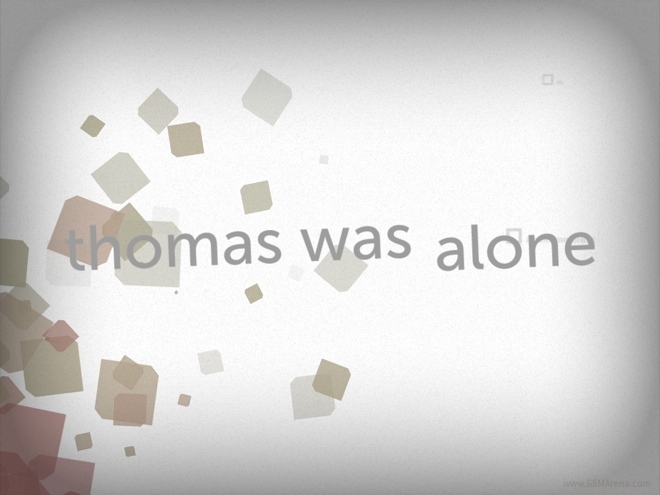 After being released on the PS3 and the PSVita last year, Thomas Was Alone was released on iPad this month. This is the first time the game is being released on a full touchscreen device and as such, features brand new controls for the new platform. We decided to take it for a spin and see how Thomas’ story plays out on the iPad. 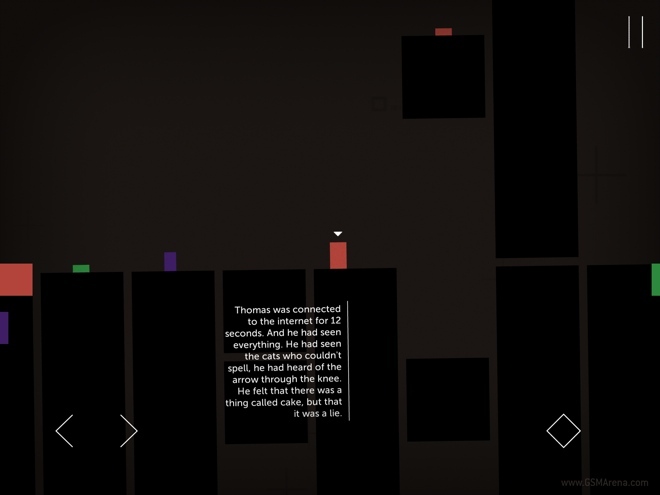 Thomas Was Alone is a 2D platforming game where you control seven distinct AIs who have the form of different quadrilaterals. Each one has its own unique personality and ability. There are some who are quite energetic, some who help others reach higher platforms and some who are useless and mostly just a burden on the rest of the group. For example, Thomas and James can jump fairly high and can take care of themselves and reach places most of the time without anyone’s help. They are practically the same, except James hangs upside down and jumps downwards. Then there are John and Sarah, both of whom move very quickly, can jump very high (Sarah can even double jump), and are generally a hoot to control. Then there are Claire and Laura. Claire is big and slow and can’t jump very high at all, but she can float on water and thus, can be used to ferry others over water, nether of whom can swim. Laura possibly has the shortest jump but you can bounce off her very high, which is useful to get to those hard to reach places. Lastly, there is Chris. Chris, is useless. He is slow, has one of the shortest jumps and has no special ability. He is basically a liability on others, and most of the gameplay often involves using others to get him to higher platforms because he himself can’t reach there on his own. I hate Chris. Other than these seven, towards the end of the game you also come across a few other characters (some of whom don’t have any special ability of theirs but they gain the ability to swim, double jump, hang upside down or turn into a bouncy surface temporarily) but these are only for a short duration of the game and most of the time you will be playing with the seven main characters. The goal in each level is to get these to their respective portal at the end. To get there, you have to jump on platforms and dodge the obstacles and often use each other’s abilities to get themselves and others to their destination. Seldom will you be playing with a single AI and almost all levels have at least two. 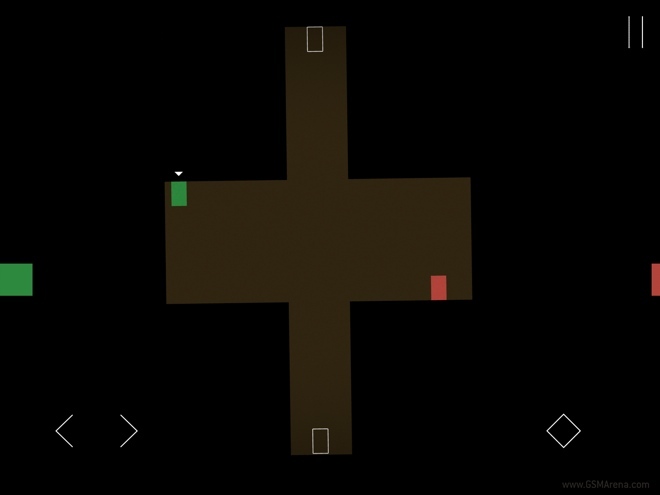 You switch between them by pressing the respective color tab on either side of the screen. On the PC and consoles, you had to use the D-Pad to cycle through the different characters, which was a bit tiring, but this method to directly select the AI you want on the iPad gives it a leg up on its bigger counterparts. 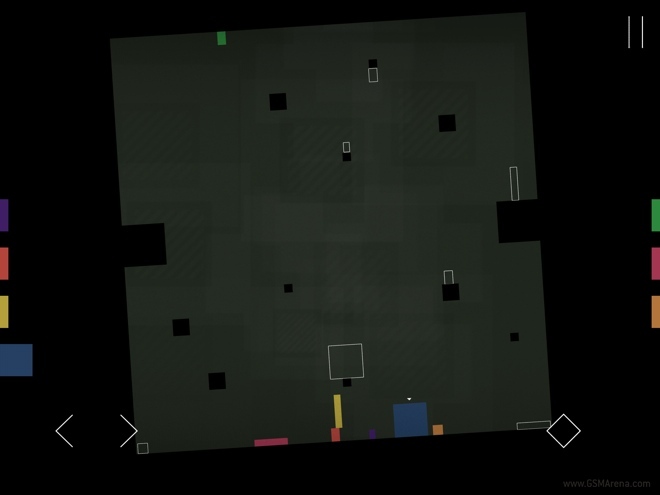 If it was just a bunch of quadrilaterals that you had to move around, the game would have probably been quite boring. Thankfully, that’s not the case. Not only do all the AIs have a name, they also have a personality. The narration is done by Danny Wallace, a comedian, writer and actor. Wallace injects life into these characters in a way that makes these 2D quadrilaterals almost seem human. He talks from the point of view of each AI and narrates the thoughts that go through their minds while they go about jumping platforms. The script is often hilarious and self referencing, where the characters are seemingly aware that they are in a game. 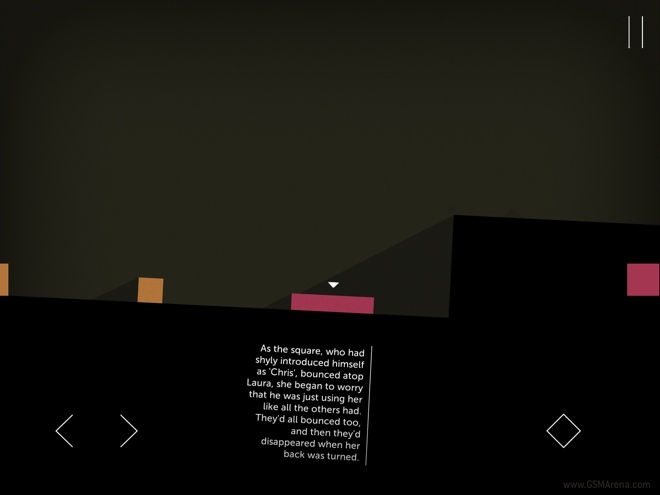 It even references other games and internet memes at times. The combination of the script and the excellent narration by Wallace is what brings these 2D quadrilaterals to life and gives them more character and personality than the human characters in most 3D games. As mentioned before, the controls have been reworked for the full touchscreen interface of the iPad. You have two directional buttons on the left and the jump button on the right. As already stated, the character switching is sorted by the tabs on the side of the screen. 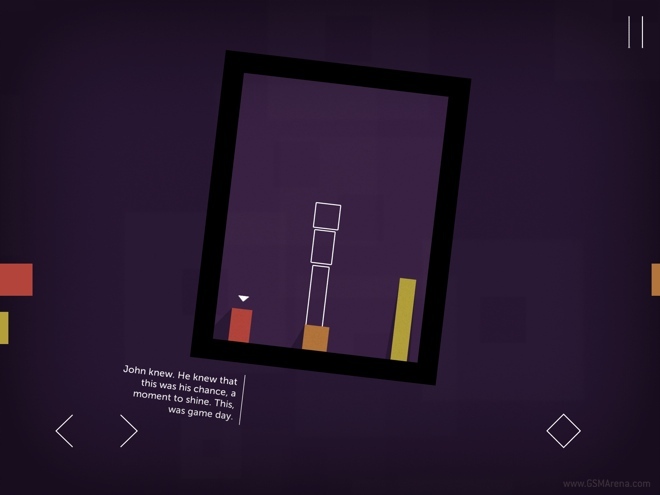 When it comes to platforming games, the importance of good controls cannot be understated. Thankfully, the controls on the iPad version work extremely well most of the time. These are still touchscreen controls at the end of the day, so you may still find them lacking compared to physical buttons. For example, it is far too easy at times for your thumb to wander off the touch target and hit a blank portion of the screen. In the end, this is a limitation of the platform, but for most parts, the game does a good job of working around it. 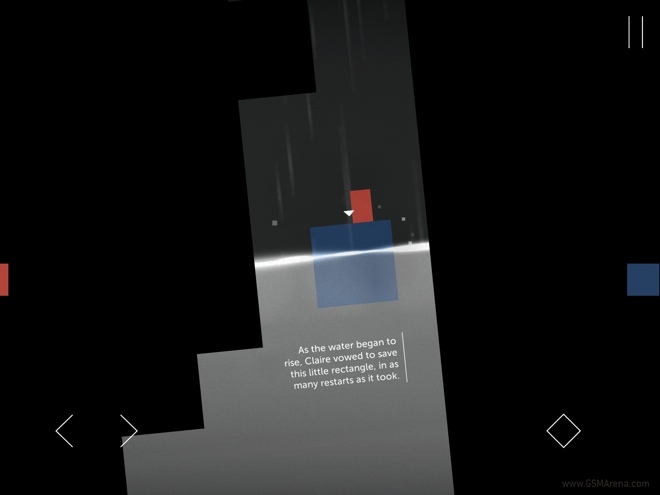 Thomas Was Alone has dozens of levels, and it should take you at least four to five hours to finish the game if you play continuously. 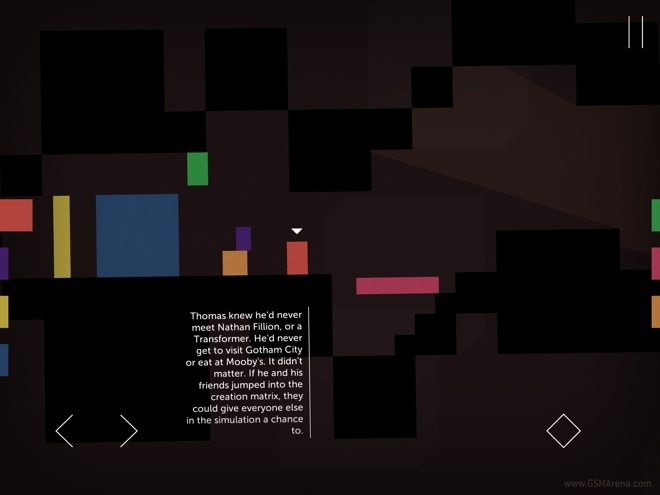 Thomas Was Alone is a simple 2D game that uses basic geometric shapes to tell a story. The levels only have as many pixels and colors as there need to be and in most cases that is enough. Each AI is assigned a different shape and color, meaning you’ll never confuse them. There is usually a single, invisible light source in the room that casts interesting shadows as you move the characters around in the room. 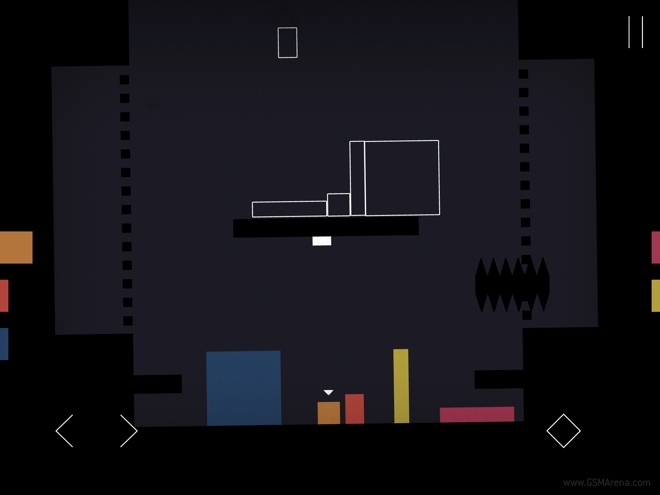 The levels can be large but the camera and field of view is only focused on the selected AI and moves around as you switch between them. It’s not the best looking game in the world but the simplicity of the visuals has its own charm. Unfortunately, the iPad version is plagued with frame rate issues. Right off the bat, you can tell from the menu animations the game is running at a less than ideal frame rate, somewhere close to 20fps. 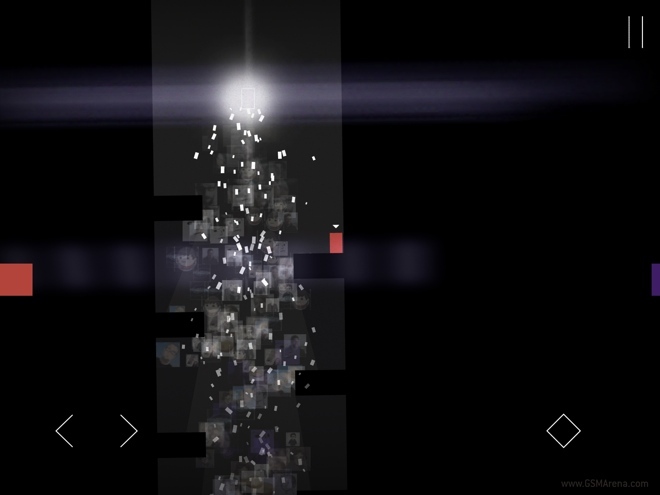 In the game itself, the frame rate varies from acceptable to annoyingly low, to the point where it actually impacts the gameplay. It varies from level to level and sometimes within a level itself. It never gets unplayable but it’s not something you can ignore and often glaringly obvious. There is no obvious reason why such a visually simple game should bring a device like the iPad Air to its knees (I’m not sure how it performs on older models) but whatever it is, I hope it is sorted out in future updates. In terms of audio, I have already talked about Danny Wallace’s excellent narration earlier. But then there is also the superb soundtrack that makes playing this game such a pleasure. The simple and often haunting soundtrack consists of several tracks and is one of the highlights of this game. You may stop playing the game but the music stays with you long after. I highly recommend giving the soundtrack a try at the game’s official Bandcamp page and purchasing it. From the moment I played Thomas Was Alone last year on Steam, I knew it would be a perfect fit on the iPad. 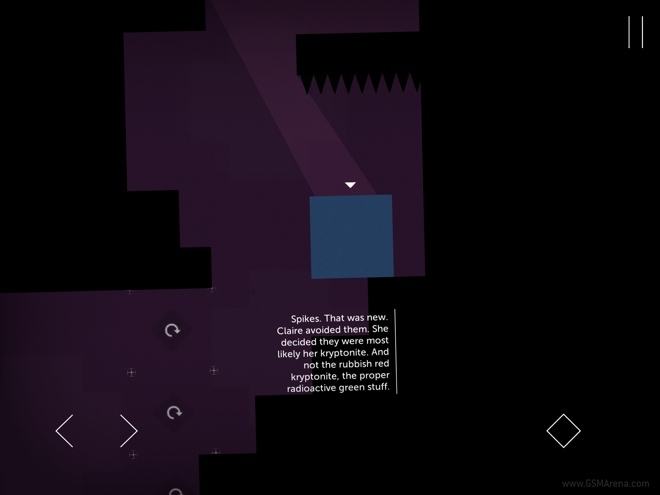 After playing the game on the iPad, I’m glad that the game is not just available on the platform but has also been executed very well. Everything great about the game, the characters, the narration, the story, the music, the gameplay, have translated beautifully to the iPad and whatever little doubts were there regarding the controls are put to rest in the first few minutes of playing the game. I wish the developers sort out the frame rate issues on the iPad but otherwise, this is as close to perfect as you can get with a game. Note: This game was reviewed on an iPad Air.